The resurgence of fried chicken is upon us, and these three classic L.A. fried chicken outlets have stuck around long enough to enjoy the renaissance. Rick Kaufman ran a shoeshine parlor and laundromat in Echo Park before frying his first bird there in 1960. 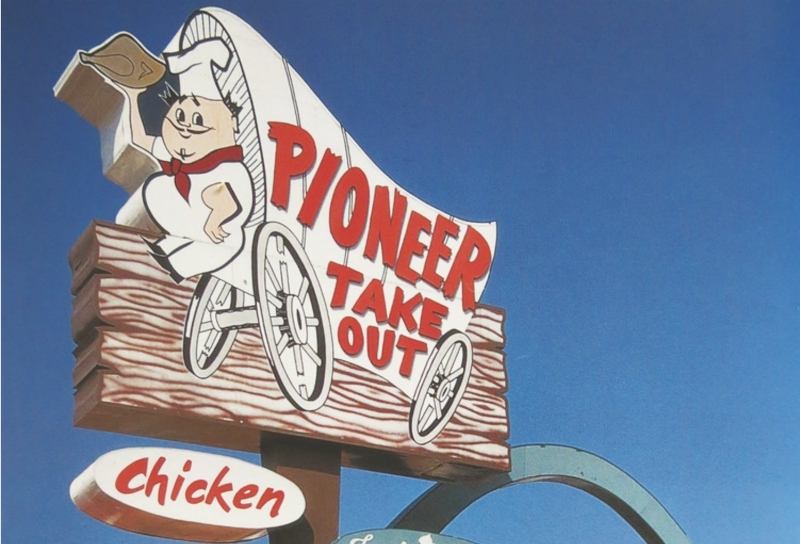 His chef mascot, Pioneer Pete, soared above 270 stores until the business went bankrupt in 1988. Two beloved phantom stores survive in Boyle Heights and Bell Gardens. Food-service giant Host International debuted this chicken-centric spin-off in 1969 with 29 restaurants, mostly in South Los Angeles. A decade later the company dumped the money-losing chain before being swallowed by Marriott. Locations remain on Vermont Avenue and Manchester Boulevard. Even though both Dinah’s sites share the same broasting (pressure frying) technique and iconic polka-dot boxes, they inhabit two universes: The 1959 original in Westchester is all sprawling Googie leisure and Sunday morning pancakes, while the Glendale outpost is stiff-backed chairs and takeout. Previous articleWhat People Should Read About L.A. Before They Move to L.A.